Letter No. 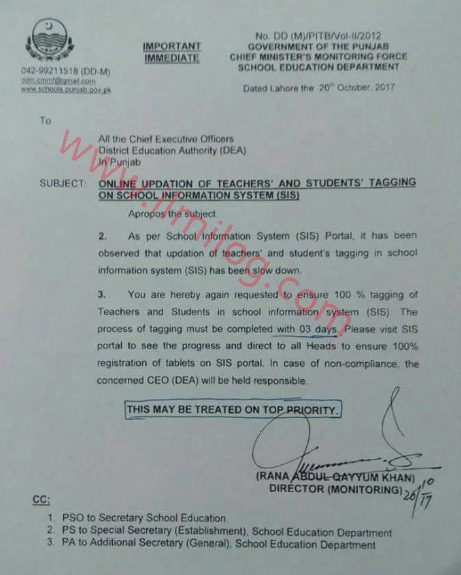 DD(M)/PITB/Vol-ii/2012 is issued by Government of the Punjab Chief Minister Monitoring Force School Education Department dated 20-10-2017 with respect to Online Updation of Teachers and Students Tagging on School Information System SIS. It is submitted to all CEOs District Education Authorities DEA Punjab. As per Class data structure SIS Portal it has been watches that Updating of Teachers and Students Tagging on Information System of schools SIS has been back off. You are thus again ask for to guarantee 100% group of Teachers and Students on Information System of schools SIS The way toward labeling must be finished within 03 days. If it's not too much problem visit SIS gateway to see the improvement and direct to all heads to guarantee 100% enlistment of tablets on SIS entrance. If there should arise an occurrence of resistance the concerned CEO DEA will be considered mindful. Information system for schools have been started to get update data of schools and students. Now it is a big initiative to start this new system in Punjab province. With the launching of this system, new era of school system in Punjab will start.